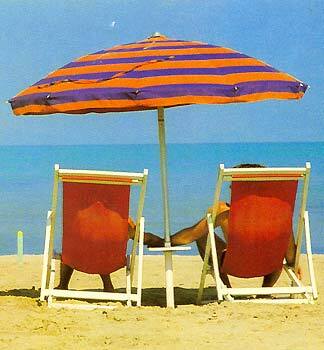 Emilia Romagna-style cuisine, courtesy, sunshine, sea and relaxation! why to book from here! The 3-Star Hotel Oceanic in Bellariva di Rimini is ready to welcome you and offer you sincere friendship and availability for your next holidays by the sea on the Adriatic Coast. Between moments of leisure and entertainment Franco and Tonino will introduce you to the typical warmth of the people from the Emilia Romagna area while guaranteeing you many top-quality services. Our faithful chef, who has been with us for more than 15 years, knows the Romagna and other types of cuisine all too well and can prepare these dishes to perfection. Do not miss the thrill of the weekly 27-metre long buffet held outside on the large terrace. › Just look at the abundance of food! In our hotel category it is rather rare to find a hotel with a swimming pool that is so large (120 m2). This is the ideal location where to spend relaxing afternoons sunbathing by the pool side. › Come and discover our swimming pool. Among the hotels with a car park in Rimini, at the Oceanic you will find an excellent solution. In fact, your parking space is guaranteed: or among the parking spaces which are subject to availability within the hotel facilities, or in the nearby car park in Via Chiabrera, where there is also 24-hr surveillance. Our modern lift is large enough to transport wheelchairs. Moreover, we would like to point out that we have attended courses held by the Italian Union for the Blind and all the staff implements a series of measures regarding blind people. Also as regards cuisine, we pay attention to everyone’s requirements: upon request, we can create special menus for those who suffer from food intolerances and above all, we can guarantee the availability of gluten-free products for the safety of people affected by the coeliac disease.
" Great hotel regarding dining, cleanliness, courtesy, hospitality; very suitable for families with children; we went with a three year old and a three-month and we loved it! "